The Plot: May “Mayday” Parker’s spider-powers begin to emerge during a basketball game. While out with her friends that night, the Green Goblin appears, telling May to send a message to her father. Later, she overhears her parents discuss Peter’s life as Spider-Man, and the final battle with Green Goblin that led to his retirement. Peter figures out that the new Goblin is Normie Osborn, but is unable to gain help from the Fantastic Five or the Avengers. 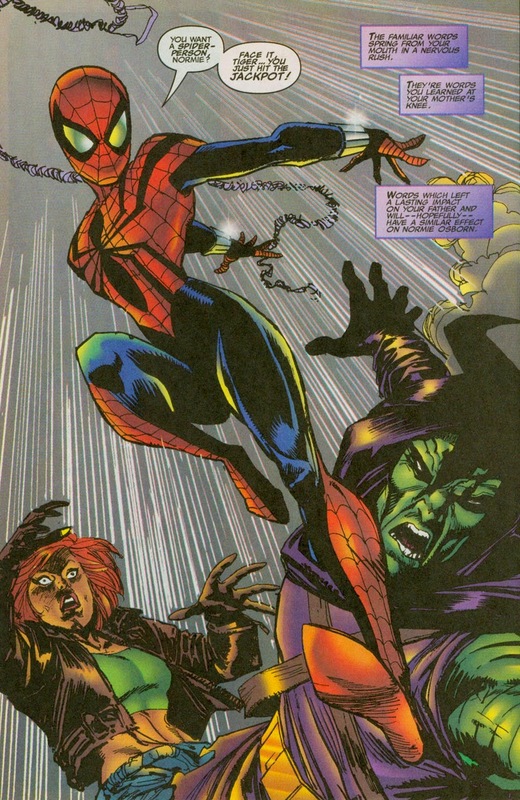 Peter prepares to meet the Green Goblin at the Brooklyn Bridge, while MJ takes May to the attic and reveals to her Peter’s past. Soon, May arrives at the bridge, wearing Ben Reilly’s old costume. During the battle, she spares Normie’s life when he’s caught in the path of a semi-truck. With Normie institutionalized, the Parkers have a ceremonial burning of Spider-Man’s possessions, unaware that May is designing her own costume and webshooters. The Subplots: May is popular with the school jocks and nerds. She has a crush on football player Brad Miller. This issue marks the debut of Spider-Girl, even though she’s never called that during the story. The recap page essentially confirms that the “package” Alison Mongrain stole for Norman Osborn at the end of “Revelations” was baby May. Spider-Man retired after his final battle with the Green Goblin fifteen years ago. The battle left Norman Osborn dead and Peter with an amputated leg. The Fantastic Five and A-Next debut in cameo appearances. Foggy Nelson is married to Liz Allan, who is suffering from a fatal disease. He also claims that Daredevil died years earlier. 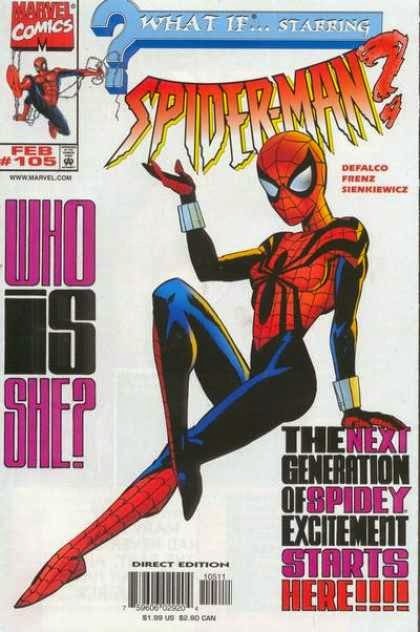 Review: Tom DeFalco always maintained that he created Spider-Girl as a one-off character for this issue of What If…?, even though the genesis for the entire MC2 Universe is here. I’m not quite sure how the concept of Spider-Girl evolved into not only an ongoing series, but the anchor of an entire line of comics in late 1998. I do remember a Spider-Girl ongoing was first promoted as a part of Stan Lee’s “Excelsior!” line of comics during the spring of 1998 (inside the same insert that promised X-Factor #150 would reveal Graydon Creed’s killer). “Excelsior!” never materialized, but within a few months, Spider-Girl and the youth-skewing MC2 line arrived in comic shops. 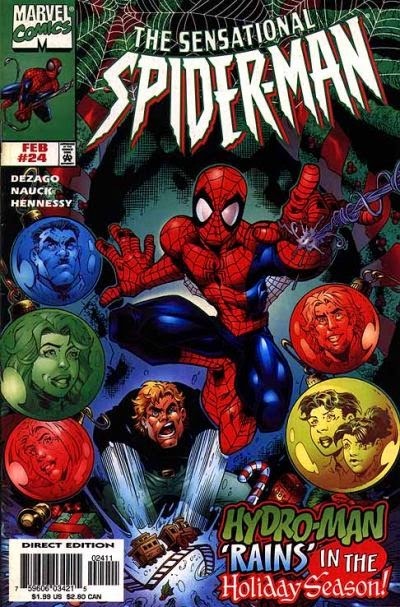 Tom DeFalco’s critical reputation as a writer had taken a hit after his run on Amazing Spider-Man, and many fans instantly hated the idea of a line of “kids” Marvel titles, so the early buzz for the series was mostly negative. Within a few issues, however, Spider-Girl had developed a healthy cult following, and most online reviewers were vocally supporting the book by the end of its first year. Spider-Girl became the little comic that could for several years, never becoming a hit but defying cancellation after cancellation thanks to the efforts of a devoted fanbase. Spider-Girl developed a following in large part because it was a deliberate attempt to move away from darkness and embrace a friendlier Silver Age ethos. Ironically, the character is debuting during the “dark” era of What If…?, a conscious effort to save the low-selling comic by just flagrantly giving fans what they seemingly wanted. Most What If…? issues of the day seemed to be stories about various X-Men dying in horrible ways, as rendered by Leonardo Manco. This issue isn’t nearly as dark as the standard 1998 What If…? comic, but it’s not the lighthearted, all-ages romp I tend to view Spider-Girl as either. The tone’s more solemn than what I normally associate with DeFalco’s work, and he seems to be making a conscious decision to lay off the corny retro-dialogue. Normie Osborn is recast as Robert DeNiro’s character from Cape Fear, a tattooed, buff lookalike of his grandfather, now sporting dreadlocks. This description might sound ridiculous, but wow, is he freaky-looking. Bill Sienkiewicz provides the finishes, which automatically adds a certain amount of grit and shadows to the proceedings. Pairing him with Ron Frenz is a fantastic choice, giving the issue a hint of a traditional Spidey feel, but there’s also a sense of menace that you don’t normally get with a DeFalco/Frenz collaboration. Thankfully, the story doesn’t succumb to the normal What If…? clichés of radically altering established characters or just killing them off. The closest we get is Peter’s severed leg, which does serve a legitimate story purpose. I’m not prepared to say that May Parker is an obvious choice to headline a long-running series after reading this issue, but she is likeable enough, and the basic premise of the Parkers’ teenage daughter becoming a hero does have potential. The issue finds a nice balance between a traditional superhero origin and the darker material of late ‘90s What If…?, and DeFalco’s able to deliver the needed exposition rather smoothly. It’s a solid comic all around. I really wish we could’ve seen work on this level on Amazing Spider-Man during this time. Labels: defalco, roger frenz, sienkiewicz, what if? The Plot: Peter and MJ join Ben Urich in Miami as he covers a crime wave. They spend time with Curt Connors and his family. Spider-Man discovers Billy Connors is now robbing stores, but Curt refuses to discuss his family issues. As Ben Urich investigates a new player in the Miami drug trade, Curt grows increasingly unstable. 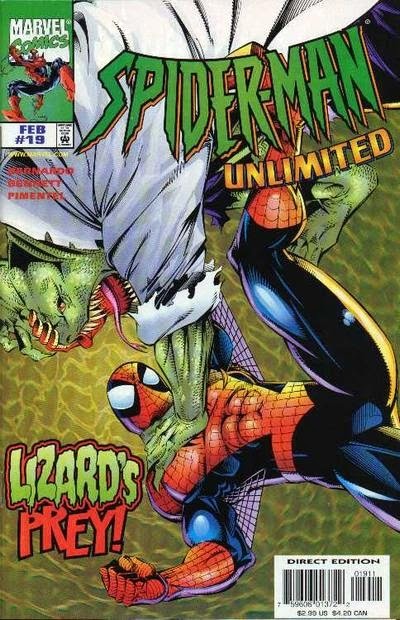 When Spider-Man deduces that the Lizard is responsible for Miami’s new street drug, he’s knocked unconscious by Curt and taken to the Miami Reservoir, where the Lizard plans to poison the city’s water supply. MJ and Martha Connors follow, and after Martha appeals to Curt’s humanity, the Lizard becomes Curt Connors again. 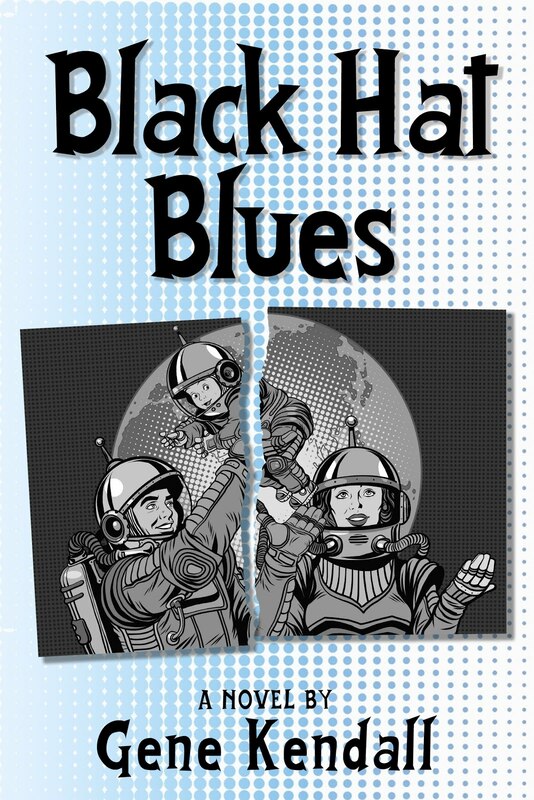 The Subplots: Martha Connors is worried about Curt’s increasingly cynical view of humanity. Unbeknownst to her, Curt has been using Billy as a test subject for his drug, which unleashes man’s “reptilian brain.” The drug eventually causes Billy to collapse and he’s taken to the hospital. 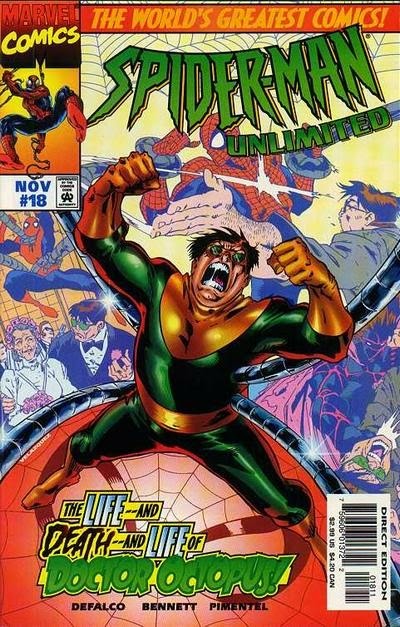 The Lizard has been subconsciously influencing Curt Connors’ actions since his last appearance in Spectacular Spider-Man #239. He claims he’s responsible for Curt revealing his dual identity to the world, which was done to take suspicion away from his latest scheme. The Slug gives Ben info on the new street drug, which he views as unhealthy competition. *See _________ For Details: Curt Connors says he last saw Peter when he was “at death’s door” in Spectacular Spider-Man #237. I Love the ‘90s: Spider-Man tells a group of kids robbing a video game store that getting to “the last screen” on Final Fantasy IV isn’t worth a jail sentence. Later, we have references to Andy Sipowicz, Ted Kennedy’s alcohol problem, and Peter getting paged at the hospital after Billy collapses. Review: A fairly ambitious story by Unlimited standards, Mark Bernardo takes the Lizard’s quaint “reptiles rule the Earth” motivation and actually does something smart with it. The Lizard can work as the freaky monster single-mindedly determined to kill Spider-Man, but every time he starts talking about his latest scheme to destroy all humans so that reptiles can take their proper place on top of the food chain, I’ve always checked out. Bernardo plays with the concept a bit and makes the Lizard a subconscious influence on Curt Connors this time, which enables him to develop a far more elaborate scheme. Connors has created a variation of his original serum that exploits the human brain’s R-complex, allowing an individual to be free to give in to his darkest desires. With enough doses, the humans will grow more reptilian, thus giving Lizard the revenge against humanity he’s always desired. By the standards of Lizard plots, this is quite clever. The issue does seem to be running two separate stories that never fully come together, Connors is simultaneously dosing the societal elites that attend his lectures in order to exploit their connections while also selling the serum as a street drug, but it’s not a conspicuous problem. Bernardo spends much more time with the drug trade story, which is probably the best choice. Had this been a multi-part storyline in one of the monthly titles, I’m sure more could’ve been done with Lizard’s army of upper-level civil servants. The best Lizard stories are the ones that make the Connors family sympathetic, and this issue handles that material rather well. Connors’ contemptuous view of humanity is an obvious clue that he’s being subconsciously influenced by the Lizard, but there’s more to the story than that. Connors’ Vietnam background is explored for the first time in ages, with Vietnam simply becoming “the war” for obvious reasons. As Martha eventually realizes, Curt is a surgeon who went to war and came back without an arm. Robbed of his opportunity to help others, Curt buried his anger for years, until the Lizard wakened Curt’s own issues with humanity. Revealing that Curt on some level understands the Lizard’s hatred of humanity is a risky move, but the story manages to avoid any cheap cynicism and offer Curt some redemption in the end. I wish I could say that Joe Bennett delivers his best art this issue, but unfortunately he’s back to the inconsistent work seen in his earlier Unlimited issues. This is still more attractive than his Amazing fill-in work, but too many pages look rushed, and it’s hard to forgive his inconsistent Spider-Man. From one panel to the next, Spider-Man’s eyes regularly change shape and the web pattern on his costume can never stay consistent. 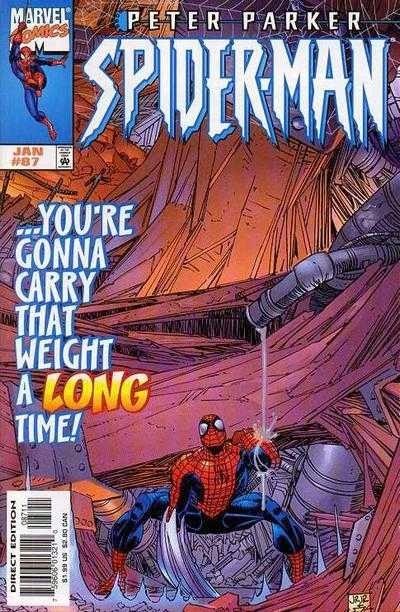 Bennett also gives Spider-Man this boxy, squashed anatomy in certain panels that doesn’t suit the character at all. Some of the pages look great, but the inconsistency is very frustrating. Had Bennett turned in an issue as strong as Unlimited #17, this would’ve been one of the better comics from the post-clone era. The Plot: After stopping by the Daily Bugle, Peter is unexpectedly given a gift by Billy Walters. That night, Spider-Man scours the city, thinking of the perfect Christmas present for Billy. His thoughts are interrupted by the Hydro-Man, who has caused a commotion in the streets. Spider-Man tries to stop him, but Hydro-Man escapes after he pushes Spider-Man through a department store window. Eventually, Peter realizes the perfect gift for Billy -- a private meeting with Spider-Man. The Subplots: Peter has purchased “The Joy of Signing” for Aunt Anna, who has become fast friends with the Parkers’ deaf neighbor Hope. He sells Uncle Ben’s collection of vintage comic books to buy MJ’s present, a weeklong trip to an exotic location. Meanwhile, Glory leaves word for Peter that a mysterious blonde woman was looking for him. Web of Continuity: A Daily Bugle headline declares that the paper has upped the bounty on Spider-Man to one million dollars, even though that’s always been the bounty since this storyline began. Also, the recap foldout gets ahead of itself, claiming that Spider-Man is on the run for events that won’t happen until next month’s “Spider-Hunt” crossover. Creative Differences: The previews for this issue originally said the story would feature Peter and MJ in the Caribbean on a cruise, along with SHIELD and the Looter. Instead, we have a Christmas story. I Love the ‘90s: Peter checks his messages on the “freelancers’ modem,” which appears to be a PC that everyone in the office shares. Review: Wow, it’s already time for another Christmas issue. Time flies within the compressed chronology of the Marvel Universe, doesn’t it? Since Dezago can’t claim that this is the “first” Christmas after losing Aunt May, he has to find another hook for the story. He instead focuses on what Peter is getting his friends and family for Christmas, which is a promising start for a story, but the execution feels a little unfocused. MJ and Aunt Anna’s gifts are “easy” for Peter to figure out, his gift to Jonah is left unrevealed, and the rest of the supporting cast doesn’t rate a mention, except for Billy Walters. Peter has no idea what to get Billy (and has a wonderfully awkward moment with Billy, as he realizes Billy’s bought him a present but he hasn’t even thought of buying Billy anything), until he realizes that “arranging” private one-on-one time with Spider-Man would be the perfect gift. I don’t recall Billy being established as that much of a Spider-Man fan, and moving him in this direction doesn’t do a lot to dissuade my belief that he’s Jimmy Olsen transplanted into the Marvel Universe. I think Billy’s scenes work best when Peter’s unintentionally hurting his feelings, but I guess we’re supposed to be happy that Billy’s finally catching a break now. It is nice to see some attention paid to the supporting cast, an element this era of the books couldn’t quite figure out, even if Todd Nauck’s not really suited for these scenes. He’s still extremely cartoony at this point, so much so that Peter looks around four feet tall on some pages. Nauck’s “chunky” style isn’t so bad when drawing Spider-Man, by the end of the issue he’s found a decent handle on the costume, but his human figures are so goofy looking it’s distracting. As far as Christmas stories go, this is decent enough, but the inclusion of Hydro-Man is an awkward fit. He only appears in four pages of the story, offers nothing to the plot, and doesn’t provide much of a fight scene either. What’s the point? And if you’re doing a Hydro-Man story set during Christmas, aren’t you kind of obligated to have him turn into snow at some point? The Plot: Spider-Man is framed by a series of lookalikes who have super-strength and web-shooters that fire bullets. Daredevil suspects Spider-Man is innocent and offers to help him investigate the scheme. They soon discover that a scientist working for the Kingpin, Dr. Mindella, has created Death’s Arrow, a drug that induces super-strength before causing death. While fighting the Kingpin’s men, Daredevil is exposed to the drug. Kingpin takes advantage of Daredevil’s confused mental state and uses him as a secret weapon against Zoltaro, a terrorist who has arranged to purchase a supply of Death’s Arrow. Spider-Man crashes their exchange, as Zoltaro and Kingpin turn on each other. 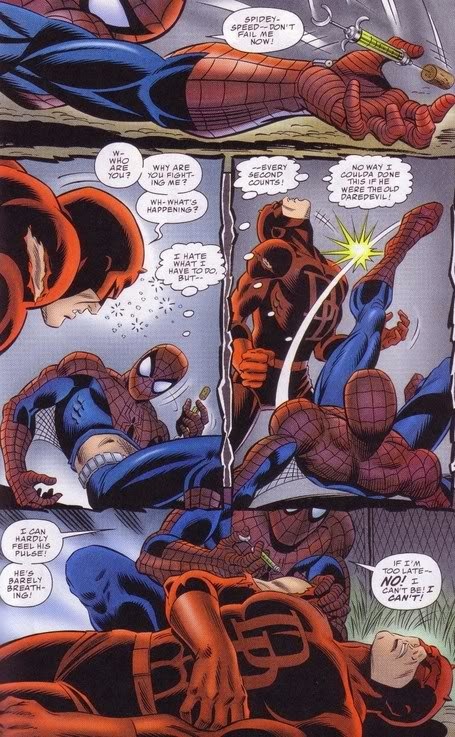 Spider-Man is able to inject Daredevil with the antidote and spare his life. Kingpin kills Zoltaro and safely escapes, while Dr. Mindella is arrested. Later, Peter Parker submits photos clearing Spider-Man of his doppelgangers’ crimes. Web of Continuity: Captain America and the Fantastic Four appear in a scene that has various Marvel heroes attempting to apprehend the framed Spider-Man. This means the story must take place after Amazing Spider-Man #430, which features Spider-Man’s relieved response to the return of the Fantastic Four and the rest of the “Heroes Reborn” characters. Creative Differences: Zoltaro is referred to as a “gang-lord” on the back cover, but portrayed as a terrorist in the actual story. 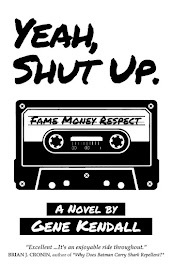 Production Note: This is a forty-eight page bookshelf format comic, with a cover price of $5.99. Unfortunately, the Kingpin’s role is interchangeable with any mobster character, or just generic supervillain really, which is a major reason why the story feels like nothing special. 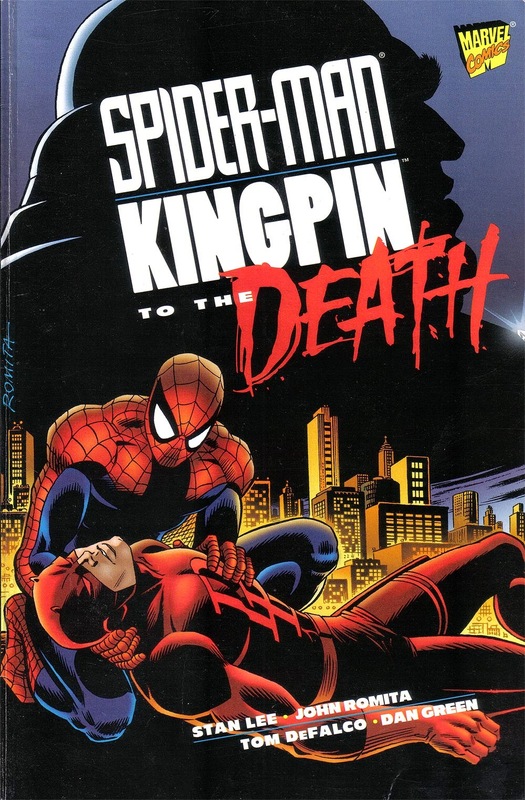 Marvel could’ve made the six-dollar comic more of an event if it truly served as a reintroduction of the Kingpin and impacted future issues of Daredevil or the Spider-Man titles. Instead, it’s a glorified fill-in plot with Kingpin as the very generic villain. Spider-Man, for the most part, doesn't fare much better. Stan Lee became famous in the '60s for making the heroes, and even some of the villains, well-rounded fictional characters with distinct personalities. Spider-Man only feels uniquely Spider-Man in this one-shot when he concocts a quickie antidote that will save Daredevil at the story’s end. The Kingpin is a ruthless thug, but also an intelligent businessman, a patriot in some regards, and a father and husband with a complex relationship with his family. The plot exploits none of these elements. Instead of wanting to stop a terrorist, Kingpin’s motive for double-crossing the ridiculously named Zoltaro is that he simply wants to keep Zoltaro’s money and the drugs he just sold him. Surely, as a “legitimate businessman,” the Kingpin must know that this kind of stunt will ruin his reputation and kill any future deals. Statistically, spurned terrorists tell at least fifteen other vaguely Middle Eastern terrorists when they’ve had bad business dealings with an American imperialist pig. There’s also the utterly gratuitous plot element concerning the fake Spider-Men. Not only does this idea feel like it belongs in a different story, but it’s too dumb to be taken seriously. Why do the fake Spider-Men have super-strength and bullets that shoot out of their wrists? Why would they take this drug, which is fatal within a few hours of ingestion, when they can blast machine gun fire out of their wrists? I realize that Marvel wanted Romita to draw as many heroes as possible in the one-shot, so Spider-Man’s been framed in order to set up their appearances, but is this really the best excuse DeFalco could think of? If you are going for the Marvel Universe vs. Spider-Man plot, why isn’t that the main story? Who cares about Zartan-O the terrorist when you could have more pages of John Romita drawing every Marvel hero? Also, of all the heroes, why is Daredevil the only one smart enough to even suspect Spider-Man has been framed? And did Tom DeFalco not realize that he was using a nearly identical plot in Amazing Spider-Man #429? The one-shot does have John Romita’s art going for it, though. If you just want Romita drawing Spider-Man and Daredevil, this is exactly what you’re looking for. The characters are all well-constructed and consistently on-model, and it’s interesting to see how Romita conforms to the larger eyes Spidey developed post-McFarlane. In a perfect world, Spider-Man’s look on the cover would be an excellent model for future artists to follow. I don’t think the paper stock really does Steve Oliff’s colors any favors; the preview pages I saw in Wizard looked great, and Oliff’s work on Spawn at this point was considered the best color art in the business, so it’s a shame that the published book looks so drab. The Spawn paper stock of this era, which was very glossy but didn’t have that obnoxious glare that’s so prevalent in comics printing, would’ve been perfect for this book. Also, as ridiculous as the plot is, I have to give Stan Lee credit for a decent scripting job. He manages to work in a crack or two regarding the more cliché elements of the story, but the relentless jokiness that often appeared in his later scripting jobs is mostly gone. He’s not given much to work with, but Lee still delivers a perfectly competent script that’s old school but just shy of corny. Honestly, his dialogue is more plausible and natural than most of DeFalco’s work from this period. The Plot: In Queens, Peter and MJ discuss the past of Dr. Octopus, as do obit writer Dilbert Trilby and Ben Urich at the Daily Bugle. Inside Dr. Octopus’ underwater headquarters, Lady Octopus also reviews the career of Dr. Octopus. Due to the gaps in his memory, Dr. Octopus must rely on Lady Octopus’ recaps of his life, which help to fuel his hatred of Spider-Man. Matt Murdock is established as Dr. Octopus’ original lawyer after his first arrest, which I believe to be new information revealed this issue. This is unexpected...the ultra-obscure Dilbert Trilby was used years later as a part of the viral marketing campaign for Sony's The Amazing Spider-Man 2. Lady Octopus reveals that Kane killed Dr. Octopus before she could update his most recent memory files, which is why Dr. Octopus doesn’t know Spider-Man’s secret identity. Lady Octopus was keeping Ock’s memory files so that he could one day use a VR avatar like Stunner’s. Review: I doubt stories like this did much to discourage Unlimited’s reputation as filler, but I do have some fondness for recap comics. Before the days of abundant reprint volumes and digital downloads, recap comics were often your best bet for finding out the details of comics published before you were born. I can remember rereading the Jean Grey funeral issue of Classic X-Men numerous times and never growing bored as a kid. This was the entire history of the X-Men (at that time) all summed up in one comic. That’s a big deal to a kid. If you’re a fan of Doc Ock but don’t know too much about his early appearances, or the retconned origin material, then everything you would want to know is here. 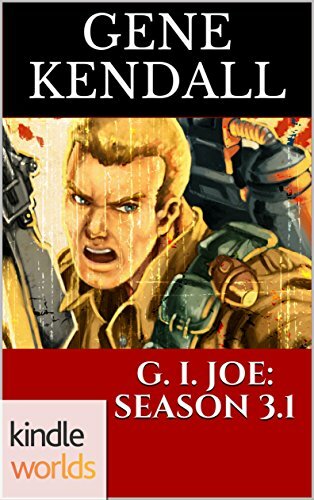 I also have to give Joe Bennett credit for his work during the flashback material. His interpretations of Spider-Man are still occasionally inconsistent, but most of his pencils this issue are solid. The splash page of a ‘90s style Spider-Man swinging past a montage of angry Dr. Octopuses looks great; I wish we could’ve seen this Bennett during those endless Amazing Spider-Man fill-ins. The story also works in the origin of Lady Octopus, explaining in detail how her past intertwines with Ock’s, which is something I personally appreciate as someone who never read her origin story and only vaguely remembers her from the Clone Saga. The character work isn’t as strong as DeFalco’s previous Dr. Octopus story in Unlimited #3, but Otto Octavius is still fleshed out fairly well during the issue. He’s violently anti-social, yet has a soft spot for non-threatening females, especially ones that play to his ego. This helps to explain the blind devotion of both Lady Octopus and Stunner, two characters Octavius seems to genuinely care for. I’m not sure why DeFalco felt the need to revive these characters, but if they’re going to be around, it’s nice to have their motivations summarized for everyone who couldn’t keep up with the clone insanity. The Secrets of Dr. Octopus! The Plot: The details of Dr. Octopus’ metallic arms are revealed. Review: I’ll defend the main story, but this really is filler. The last thing you should follow a recap story with is one of those instructional back-ups, even if it’s done in the retro-style of Untold Tales of Spider-Man. These primers can also be fun for new readers, but I tend to think they should only be attached as back-ups in comics with an original story. As is, the reader is getting essentially nothing new out of this comic. The Plot: Dr. Octopus watches the comatose Stunner and reflects on her life. He leaves her a rose. Review: More recaps! Doc Ock stares at Stunner and reflects on how similar her past is to his. There is something to the Ock/Stunner relationship, the idea that she’s essentially a female version of him that’s been remade as a Playmate bodybuilder with technology, that has potential. Not that a four-page back-up is really going to explore those depths. The extra pages this issue really should’ve been dedicated to an actual story. The Plot: Batman follows Talia to New York, where she meets with the Kingpin. Talia offers Kingpin a chance to join her father’s organization in exchange for a cure for his sick wife, Vanessa. Spider-Man discovers Batman as he spies on Talia. The heroes agree to join forces. Kingpin accompanies Talia to Tibet to meet her father, Ra’s al Ghul. Spider-Man and Batman follow. As the heroes fight al Ghul’s men, Kingpin presses the button that should cause New York to be flooded. Instead, it destroys al Ghul’s satellite. Kingpin reveals that he’s been plotting against Ra’s al Ghul for months and that he invited Spider-Man and Batman along. Ra’s al Ghul congratulates Kingpin and allows the heroes a safe journey home. Later, Talia sends Batman a cure for Vanessa, stolen from her father’s scientists. The Subplots: After being reunited with the Kingpin in Paris, Vanessa Fisk is now dying of what appears to be cancer. Later, Ra’s al Ghul reveals that she was infected with a virus he designed to mimic cancer. Before leaving for Tibet, Peter nervously tells MJ at his “favorite diner” Mickey’s that he’ll be gone for a while. I Love the ‘90s: Ra’s al Ghul is exploiting fears about the new millennium by triggering natural disasters across the globe. 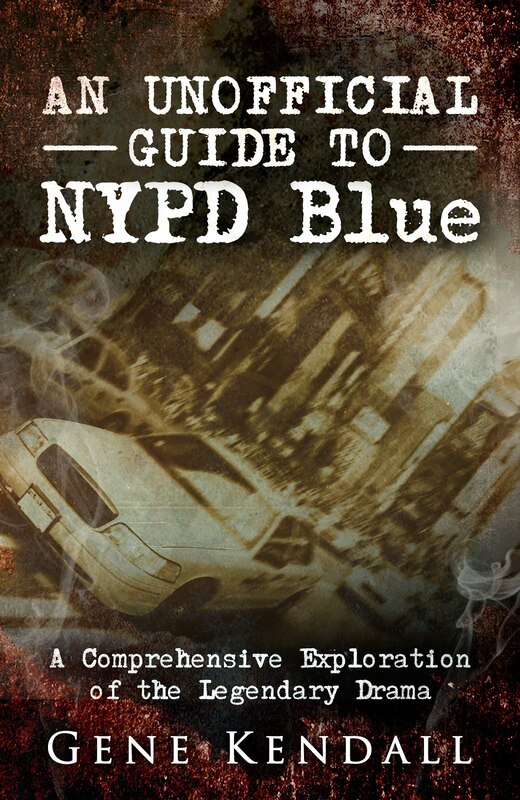 Production Note: This is a forty-eight page, bookshelf format one-shot on glossy paper. The cover price is $4.95. 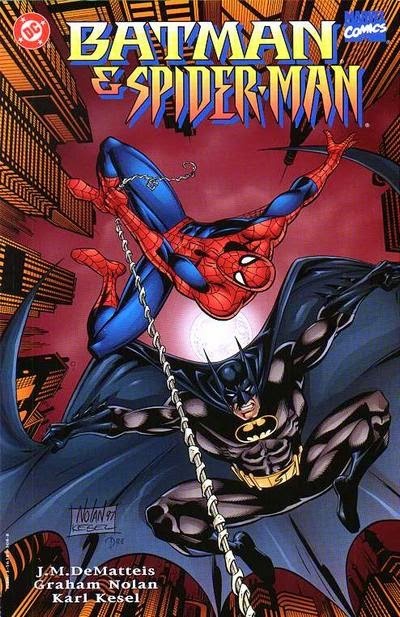 Review: This is DC’s contribution to the Batman/Spider-Man crossover series; the first chapter was published by Marvel in 1995 and set shortly before the Clone Saga. While J. M. DeMatteis wrote both chapters, he seems less interested in a psychological examination of the heroes this time, instead focusing on Kingpin and Ra’s al Ghul. DeMatteis plays up the idea that both men are utterly ruthless but also surprisingly human, a concept dramatized very well in a conversation between Talia and Vanessa Fisk. Both women have a hopeless belief that their partner can change, but both are blinded by love, be it paternal or romantic. Kingpin is unexpectedly allowed to play the hero in the story, which is a great fake-out after DeMatteis goes out of his way to give him a plausible justification for working with Ra’s al Ghul. I don’t remember where exactly it was established that Kingpin refuses to work with terrorists, ones targeting New York at least, but it’s a great character bit, one that J. M. DeMatteis puts to excellent use here. There’s an interesting dynamic between Ra’s al Ghul and Kingpin, as Ra’s al Ghul is viewed as a more “honorable” villain than Kingpin, yet Kingpin is the one who’s pragmatic enough to realize just how revolting Ra’s al Ghul’s actions really are. Because the villains receive so much of the focus, Batman and Spider-Man are often left in the background. DeMatteis plays the heroes’ personalities against one another very well, but it’s clear that this story isn’t meant as a deep exploration of these characters. DeMatteis covered that territory in the first chapter, which is explicitly in-continuity (with this specific crossover), so he isn’t going to repeat himself. Spider-Man even tells Batman that they’re going to skip the obligatory hero vs. hero fight, because they did that the last time they met. The first chapter had fantastic artwork from Mark Bagley, who draws a Batman that’s just as iconic as his Spider-Man, which sets the bar very high for Graham Nolan. 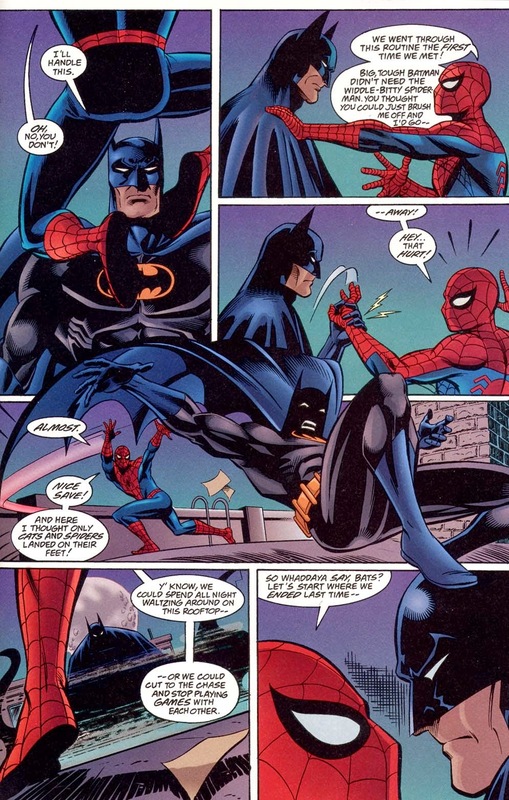 Nolan does perfectly competent work throughout the comic, but it’s hard to deny that his Batman far exceeds his Spidey. Nolan’s Batman is an angular, black creature of the night when needed, and the brawny Neal Adams action hero whenever the story requires him to step out of the shadows. Nolan’s Spider-Man is…straight out of Marvel Team-Up. There’s nothing particularly wrong with it, there’s just a sense that we’ve seen this version of Spider-Man numerous times before. Nolan’s art serves the story very well, but the pages featuring Spider-Man just don’t have the same impact as the Batman pages. Perhaps that’s fitting for the DC chapter, but I'd love to see a Spider-Man that looks just as good as Batman. The Plot: Spider-Man and Paul are buried under a building demolished by the Shocker. Spider-Man saves Paul from the debris and they then sneak away in the sewers. At ESU, Spider-Man tries to develop a solvent that will dissolve the Trapster’s glue, but they’re soon discovered by Shocker and Trapster. The villains are ready to strike again, when Trapster receives word that the hit is off and they’ll be paid double to leave Spider-Man and Paul alone. Elsewhere, Donovan Zane confirms the hit has been cancelled, which pleases an employee of Norman Osborn. The Subplots: Jimmy-6 tells MJ that he’s only looking for a place to recover and won’t hurt anyone. Suddenly, an armed man attacks the Parkers’ home. Jimmy-6 interrogates the gunman, but he swallows a cyanide capsule and dies. Jimmy-6 sees a goblin tattoo on the gunman's arm. MJ discovers Jill was shot during the attack. Web of Continuity: Spider-Man spontaneously mentions the video of him beating Norman Osborn and the price Osborn’s put on his head, the first reference to these events in this title. I Love the ‘90s: The Trapster carries a pager. A pager and a cell phone, which I don’t quite understand. Review: I guess there’s a “strange bedfellows” theme this issue, as people who can’t stand one another are paired together and forced to either work collectively or merely survive. Not a bad premise, but Mackie’s inability to write entertaining, or even slightly plausible, banter amongst Spidey/Paul and Shocker/Trapster kills the issue. Like always, the art is attractive, especially the sequence that has Spider-Man lifting the debris to save Paul, but the story is just a chore to finish. After a tedious issue-long chase sequence, the story simply ends when the villains get a phone call on the next-to-last page. Norman Osborn (presumably) doesn’t want these guys dead, so that’s it. Everyone go home. All of the interactions between the characters are just flat, and the attempts at humor are shockingly hackneyed. There’s even an “Oh, no! I have to give this dude mouth-to-mouth to save his life…but I’m a dude!” bit in here. The only scene that’s even slightly amusing comes on the final page, when Spider-Man figures out an ingenious way for him and Paul to liberate their glued feet. They take their shoes off. Alternating with the Shocker/Trapster story is a subplot involving Jimmy-6, which has abruptly swerved from him threatening MJ with a gun to saving her life when a mystery man attacks the house. It’s hard to find a coherent story in here. Jimmy-6 was attacked by mobsters last issue, who may or may not be working for his father Fortunato. After arriving at the Parkers’ house, an armed man suddenly appears, so of course these plots are related, right? Apparently not, since the villain has a goblin tattoo, which means it’s just a massive coincidence. I can appreciate that Mackie is playing around with audience expectations, but the subplot feels more like a series of random events than a story. The goblin tattoo is particularly annoying. For one thing, the art isn’t clearly a goblin; it could just as easily represent the Jackal, which is the last villain I want to be reminded of post-Clone Saga. Secondly, since when do Norman Osborn’s men tattoo themselves with their boss’ supervillain disguise? Who could be that dumb? Also, why is Norman Osborn ordering Peter and Paul to be saved, while simultaneously sending gunmen to kill MJ, Anna, and Jill? There’s no logic in this. What really kills the subplot, however, is the lethargic execution. MJ shows absolutely no emotion during the entire episode. Her dialogue consists of “You need a doctor.” “Whatever you say.” “That would be great.” And when she discovers her alleged best friend has been shot, this inspired line: “You’re going to be fine, Jill. Aunt Anna, call an ambulance. Now.” All of the blame can’t be laid on Mackie, to be fair, since Romita has decided to give MJ barely discernible facial expressions during the entire subplot. Why I can’t begin to understand, but the result is a subplot that involves Spider-Man’s wife nonchalantly discovering a wounded mobster in her home, being taken hostage, dodging bullets from a mystery gunman, then discovering her best friend is possibly dying, and yet through it all she looks lost in an Ambien haze. It’s a bizarre storytelling decision to say the least.